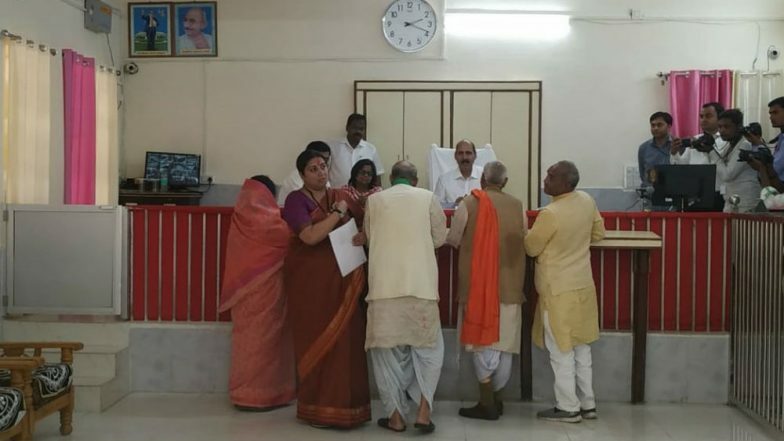 Amethi, April 11: Bharatiya Janata Party (BJP) leader Smriti Irani on Thursday filed her nomination papers from Uttar Pradesh's Amethi Lok Sabha constituency which goes to the polls in the fifth phase on May 6. Before filing her nomination papers, Smriti Irani performed a puja. Her husband Zubin Irani was also present at the puja. Irani will challenge Congress President Rahul Gandhi who is seeking re-election from Amethi Lok Sabha seat for the fourth time. Gandhi filed his nomination papers yesterday. He was accompanied by his mother and UPA chairperson Sonia Gandhi, sister and party General Secretary for eastern Uttar Pradesh Priyanka Gandhi Vadra, and brother-in-law Robert Vadra. Before filing his nomination papers, Rahul Gandhi held a massive roadshow in Gauriganj, district headquarters of Amethi. Sonia Gandhi did not participate in the road show and directly arrived at the Collector's office. Irani is contesting against Gandhi for the second time. In the 2014 Lok Sabha elections, Gandhi defeated Irani by a margin of over one lakh votes. He is a three-time MP from Amethi, since 2004. Before him, it was represented by Sonia Gandhi. Besides Amethi, he is also contesting from Kerala's Wayanad parliamentary constituency.